When I was still at school, in Cornwall, I used to learn to improvise (on clarinet) by playing along to a Charlie Ventura LP - he was on a variety of saxophones - often playing the 33rpm record at 16rpm (half speed) to at least give me a chance to keep up. Lovely raspy solo here, dapper moustache n'all, from 1:25, playing on Gene Krupa's "Leave us Leap" - great audio quality, suspect the film clip has been 'tweaked'. And again at 2:15, natty braces Chas ! 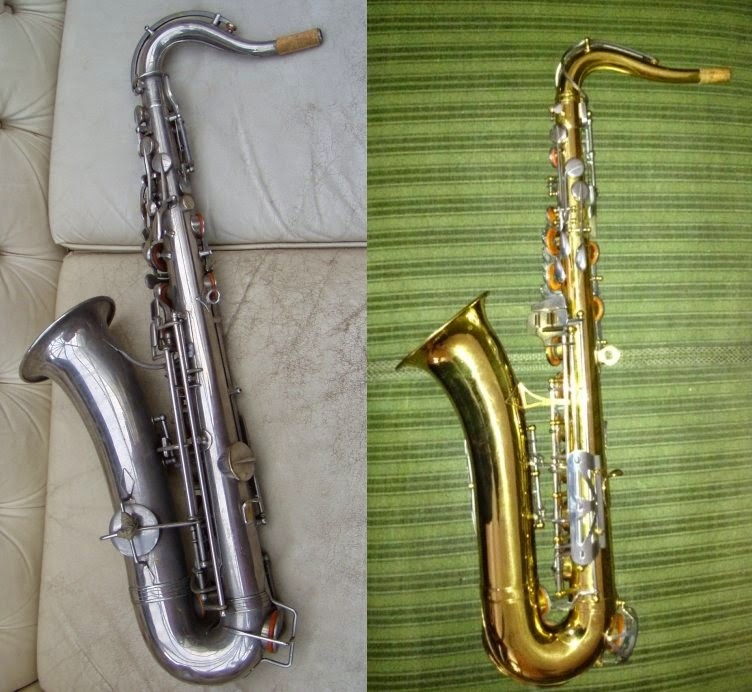 It was obvious even then that, sooner or later, I'd leg it to the nearest Secondhand Shop and swap the clarinet for a saxophone ! 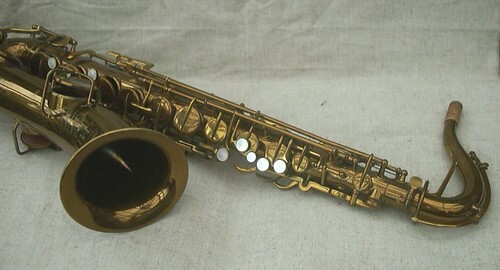 But there weren't many Secondhand Shops, let alone with old saxophones for sale, in Cornwall in the late 50's / early 60's. 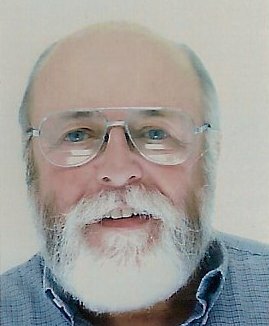 But that was a few years later, in Bath, just behind the Bus Station, where I swapped my school clarinet for a knackered old 'York' silver plated (well, mostly...) alto sax - and then, shortly afterwards, I joined my first Soul Band - Heart 'n Soul. Wiltshire Soul rocked !!! 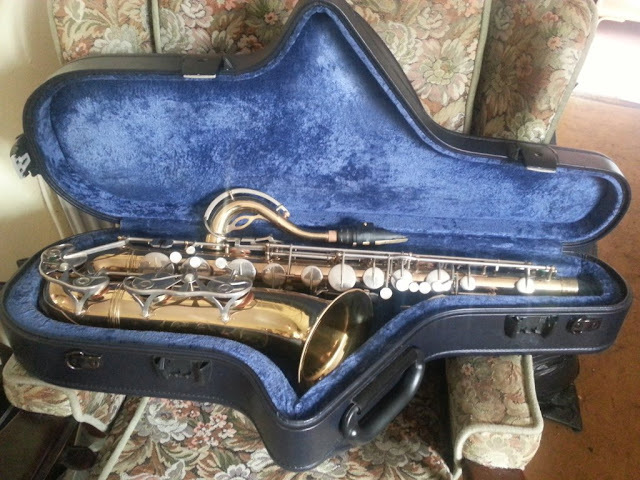 Although I'm quite happy with my current tenor sax, a German built B&S 'Blue Label' (pics here - more about it later), I couldn't resist the chance to try this 50's Keilwerth New King when it came up on eBay. The seller was offering 'Returns', so minimal risk, and there was no other interest. Looked recently repadded with brown (plastic) reflector pads. Played as you'd expect, thick smokey sound, especially low down, powerful sound, and plenty of cut in reserve with my favourite Couf J10*S mouthpiece, BUT (extremely sad part...) most of the low harmonics either weren't quite in the same place as my other horns, or (even worse...) were not to be found - even after several days of trying, even with several different mouthpieces ! Naturally I checked a few things, like pad heights - especially that the front-F opened 'just a crack'. I'm so used to using the low harmonics (G-C) as a natural extension of the normal range that it was quite a frustrating experience. Switching back to the B&S, where they just 'popped out', just confirmed the inevitable. I had a very nice Keilwerth Tone King 'Exclusiv' back in the day, I don't remember any similar problems with it. So, it has to go back, thanks to the seller for allowing returns, obviously all shipping at my expense. I'll always look at the pictures - click here - and wish that it'd been a bit more forthcoming. Sigh... Onwards and upwards ! New (old) Bb Tenor Sax - Couesnon Monopole Conservatoire II - nice ! 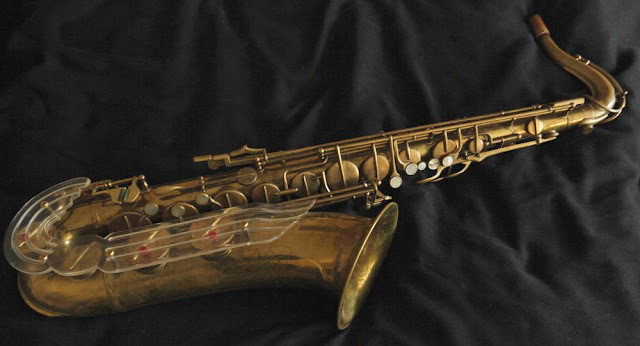 Just acquired a Couesnon Monopole Conservatoire tenor sax, s/no 149xx behind the pinkie table - I keep seeing "II" mentioned on reviews etc. but can't find anything on the engraving (apart from two pigeons ?) that would suggest that. 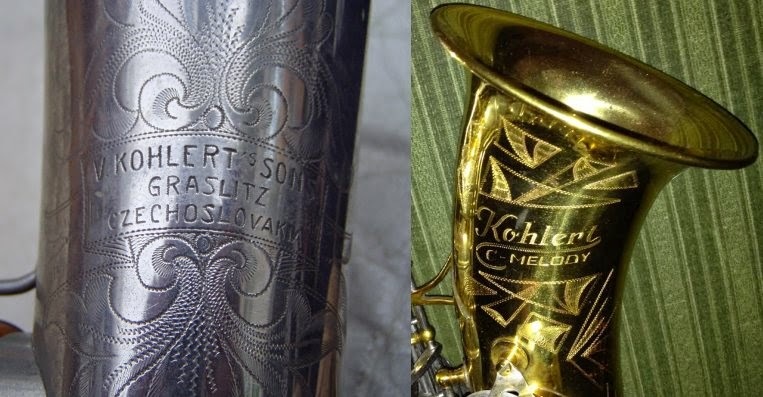 Certainly has "Couesnon Monopole Conservatoire" in the bell engraving. Plays like a dream - having been used to the more 'spread' Martin sound, I can now appreciate a more focussed sound. 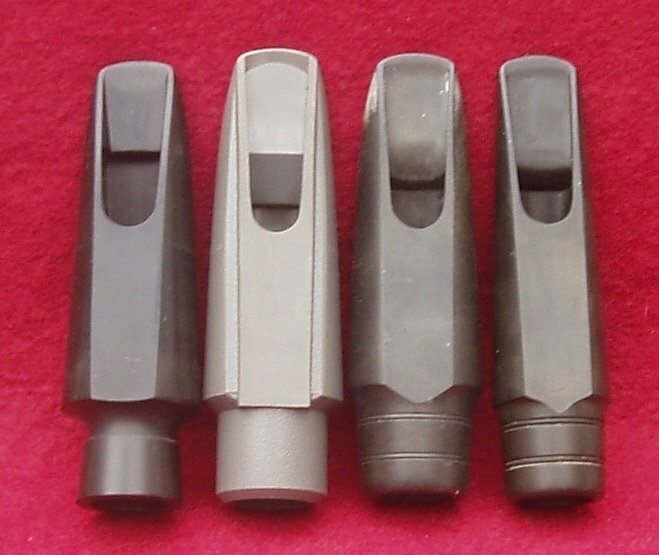 A lot is down to the choice of mouthpiece, but with my high-baffle Couf J10*S (far right in the picture below) it has all the presence you could ever wish for when pushed, subtones, harmonics, the lot - and backing off the airstream produces a more conventional sound acceptable to anyone. I did disable the linked G#/C# (etc.) on the 'pinkie table', made it a little too much of a workout for my smallest digit. 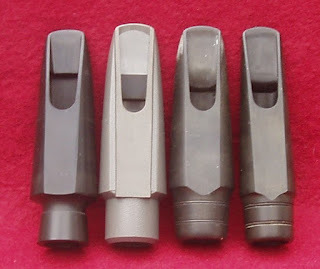 Speaking of which - I was doubtful about those shaped palm keys, but for my smaller hands the palm keys fit like a dream, as does everything else. Normally the frst thing I'd have to do is fit a riser to the palm D.
More pics (the sellers) on my flickr - click here, I'll be taking some pictures of my own very soon. No official serial numbers lists exist - the factory was burnt down, which also brought production to an end in the 70's - but I'd suggest that this was hand-built (as were all their horns) near the end of production. Hopefully, these links will also encourage Google search engines to include my Facebook witterings in normal searches - who knows ?